To get ripped shoulders, you must strength train and reduce your body fat. Since your shoulders work with other muscles in your arms, torso and hips to move your body and arms in different directions, the National Academy of Sports Medicine recommends that you perform a combination of isolation exercises to increase muscle definition and integrative exercises that use multiple body parts together. This helps you burn more calories in less time and improve full-body strength. The standing shoulder press works your deltoids, upper back, rotator cuffs and arms as you press the weights over your head. Stand with your feet shoulder width apart, and hold a 25-lb. dumbbell in each hand, with your elbows pointing out to your sides and your palms facing forward. Exhale and press the dumbbells over your head so that your biceps are close to your ears. Hold this position for one second and lower your arms back to the starting position. Do not arch your back as you lift. Perform three sets of eight to 10 reps. The standing lateral raise works on stability in your torso and shoulders as you lift the weights to your sides. Stand with your feet shoulder width apart and hold a 15-lb. dumbbell in each hand by your sides. With your palms facing the ground, exhale and raise your arms out to your sides until they are parallel to the ground. Squeeze your shoulder blades together gently as you lift and hold the end position for two seconds. Lower the weights to your sides without moving your torso. Perform three sets of eight to 10 reps. The kettlebell push press works on developing power in your shoulders by using your lower body to generate force to lift a heavy weight over your head. Stand with your legs about shoulder-width apart, and hold a 35-lb. kettlebell in your right hand over your right shoulder. Bend your legs slightly and quickly straighten them, pressing the kettlebell over your head. Hold this position for two seconds and lower the weight to your shoulder slowly. Perform three sets of six to eight reps per arm. Physical therapist Gray Cook, author of "Athletic Body in Balance," recommends that you use a lighter weight if you cannot perform the exercises with good form or if you get fatigued easily within the given amount of sets and reps. 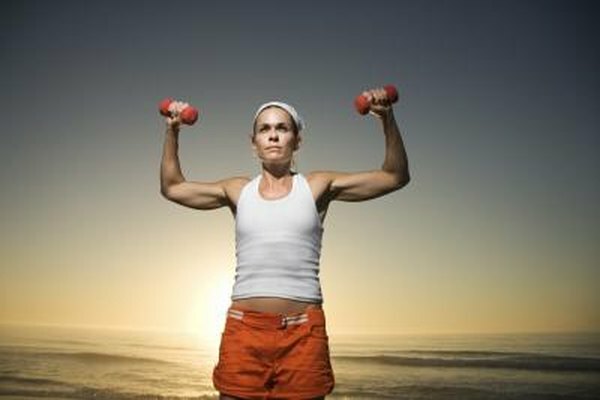 If you can perform the exercises easily, use a heavier weight.